Having started her new career in real estate sales when she joined Seeff Properties at the beginning of December last year, family commitments and a trip to Durban to spend time with family delayed her actually getting her teeth into her new career. Finally after reorganizing her and her children’s lives around her new position she finally took her place at her desk in the St Francis Bay office at the beginning of February. Many of those who work or have worked in this incredibly competitive industry will concur that making one’s first sale can take many weeks if not months of hard slog before celebrating that first sale. Well not this dynamic ball of energy who puts maximum effort into everything she does be it open water swimming in the canals or Marina Martinique or organizing St Francis College pupils in supporting various St Francis charities. After just 10 days of actually working actively as an agent Lorrin has sold her first property and got to ring the bell. 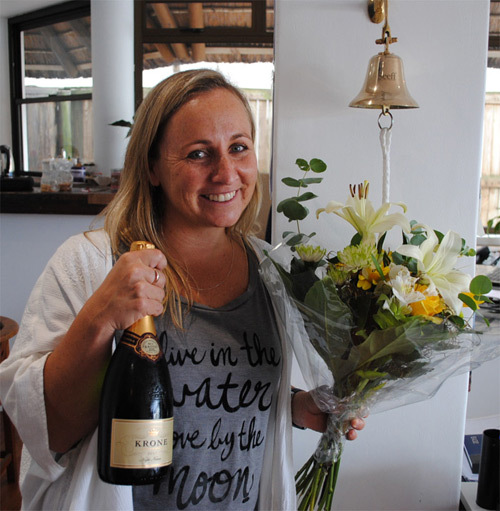 Congratulations Lorrin from the entire Seeff St Francis team.